Crown Meadow School enjoyed a flavour of South American culture when two teachers from Peru visited for a week of educational fun. 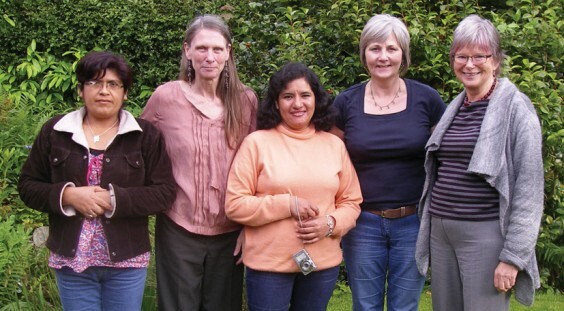 Carmela Sanchez and Maria Luisa Valdivia were on an exchange from San Lucas School in Arequipa (Peru’s second largest city), which has strong links with Alvechurch. San Lucas is one of several schools run by the Anglican church of Peru to enable children from poor homes to access high quality education. There has been a link between it and St Laurence Church, Alvechurch, for almost 20 years. In 2006, when a group led by Sue Phillips and Mike Genders started planning a visit to Peru, a teacher from Crown Meadow asked if a schools link could be made. The visit was a great success, and thanks to the dedication of Year 4 teachers Ann Russell and Veronica Porter, a two-way link was established with the help of Skype. This was consolidated by a visit to St Laurence from a Peruvian pastor and a search for grant-awarding bodies, and the vision began to turn into a reality. The British Council and Westhill Endowment both agreed to grant funds towards air fares. And so Carmela and Maria Luisa spent a week observing lessons and introducing educational activities and games that they use in Peru, including paper weaving and crafts with crepe paper and string. Each activity has a clear educational purpose but is fun for the children. That will be especially reassuring to the two Crown Meadow teachers who will spend part of their summer break teaching in San Lucas school. At the end of the week Year 4 were invited to hold their end-of-year concert at St Laurence Church, with Carmela and Maria as guests of honour. The programme included items by Alvechurch Community Choir, St Laurence Singers, a recorded performance from Year 2 children at San Lucas School, songs by Year 4 in English and Spanish and two violin pieces. After a combined effort from Year 4, the PTA and members of St Laurence, a gift of more than £700 was sent back to San Lucas to help equip their ICT suite.